The original version of this report contained errors in Table 5.F3. Some monthly benefit-range breakdowns were incorrect. The correct rows and labeling now appear in this report. 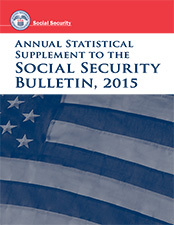 The original version of this report contained an error in the Social Security (Old-Age, Survivors, and Disability Insurance) Program Description and Legislative History. In the Coverage and Financing section, the combined employer-employee OASDI tax rate for self-employed persons was incorrectly listed as 10.4 percent when it should have been 12.4 percent. The correct rate now appears in this report.